This month's Progressive Eats menu takes a stroll down memory lane from each of its contributors. Lana from Never Enough Thyme challenged us to cook up a bit of nostalgia and comfort food from our childhood. At first I wasn't sure which way to go since I've already made so many of my childhood favorites like Chicken a la King, Chicken Corn Chowder, Chicken Pot Pie, and Chicken Noodle Soup. 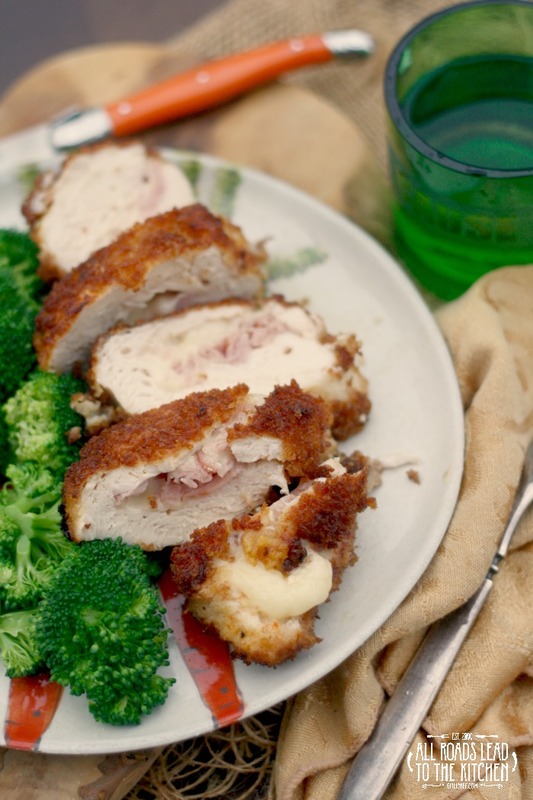 But then I remembered something that I hadn't shared yet that holds a special place in my heart—Chicken Cordon Bleu. I guess I didn't realize it before now, but there seems to be a theme to some of my favorite childhood foods. I was going to suggest that chicken was easy to come by back then until I realized that a couple of those dishes actually originated from a can. But not this one. Chicken roll-up night was always a favorite in our house, and us kids were always tasked with pounding out the chicken breasts as thin as we could get them without ripping them (much). Sometimes we had pepperoni roll-ups (which I've been meaning to share for years), and sometimes we had this. I loved layering the thin slices of deli ham and Swiss cheese inside the chicken, and they way they would adhere to the meat like they were meant to be there. One reason that I save these for special occasions is that I really don't look forward to pounding out chicken breasts in my smaller than small workspace. That was until one day when I had the bright idea to just butterfly the breasts or cut a pocket in them and stuff them. Sometimes it's the simplest things that don't hit us right away, isn't it? 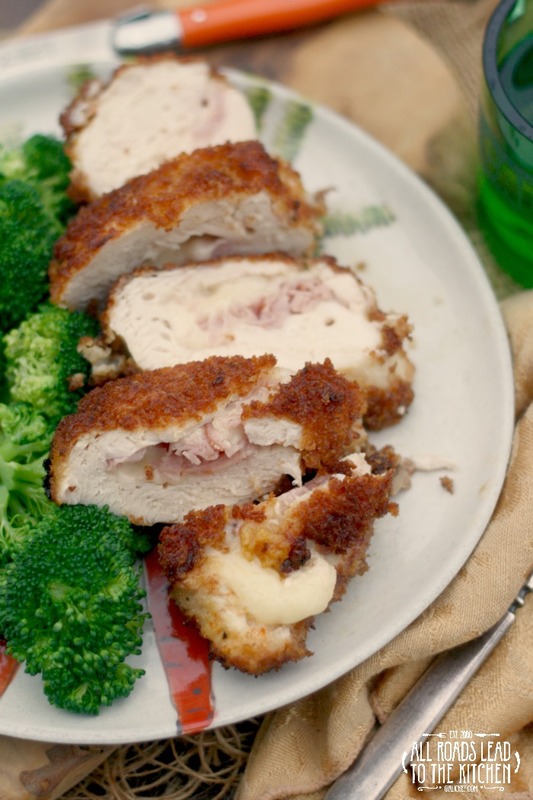 So today I'm sharing an updated and fairly simple version of Chicken Cordon Bleu with you. Instead of leaving the meat and cheese whole, I shredded and chopped them to make them easier to stuff inside. We used to put Dijon mustard on the breast before adding the meat, but this method adds it to the egg wash. Since it is finished on the stove top, the steam keeps it from drying out, so I didn't make a white sauce to serve with it—but you definitely could if it's something you require of your Chicken Cordon Bleu. One bite is like being catapulted back to 1985. 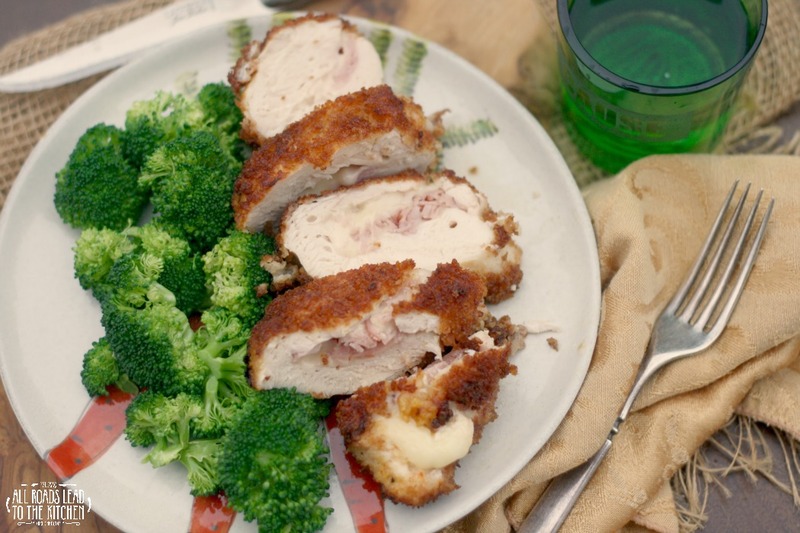 Moist chicken breast stuffed with ham and Swiss cheese, then wrapped in a golden bread crumb blanket. This version is made entirely on the stovetop! Butterfly the chicken breasts by using a sharp knife to slice a pocket into the center of the chicken, taking care not to cut all the way through. 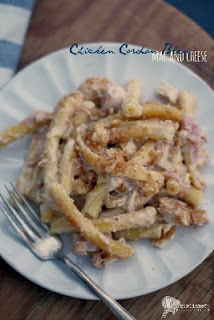 Scatter equal amounts of ham and Swiss into the pocket of each chicken breast. Use a wooden skewer to "sew" each one shut. Combine the flour and paprika in a wide, shallow dish or plate and season it well with salt and pepper. In a separate wide, shallow dish, beat together the ingredients for the egg wash. Place the bread crumbs into a third wide, shallow dish. Heat 1/4-inch of oil in a skillet over medium-high heat until you see ripples on the surface. Dredge each stuffed chicken breast into the flour mixture, coating well, then shaking off any excess. Next, dip them into the egg wash to coat. Finally, set them into the breadcrumbs and turn to coat. Carefully set the breasts into the hot pan and reduce heat to medium. Let cook until they have turned a deep golden brown all over, turning halfway through, 7-8 minutes total. Using a lid to hold the chicken in the pan carefully pour off the grease and discard. Set the pan with the chicken in it back over medium heat and add the chicken stock to the bottom of the pan. Put a lid on and cook until a thermometer inserted into the thickest part of the CHICKEN registers 165 F and the chicken stock has evaporatedm 6-7 minutes. Set the chicken breasts onto a cutting board and allow to cool for a couple of minutes before slicing and serving. Welcome to Progressive Eats, our virtual version of a Progressive Dinner Party. This month's theme is Memory Lane and is hosted by Lana Stuart who blogs at Never Enough Thyme. For our Memory Lane dinner, we all created recipes based on comfort foods which evoke feelings of nostalgia and warmth. iPad Mini + Kate Spade Keyboard Folio #Giveaway!